"Pray for the soul of Joseph O'Brien. 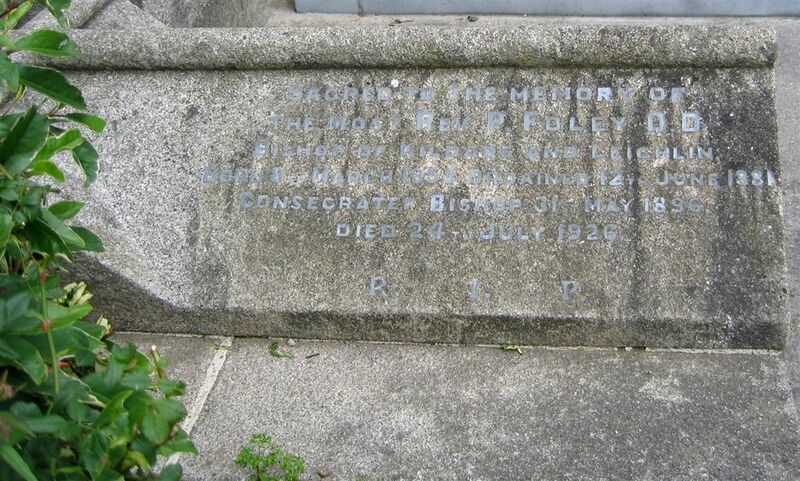 Died 9th March 1899. 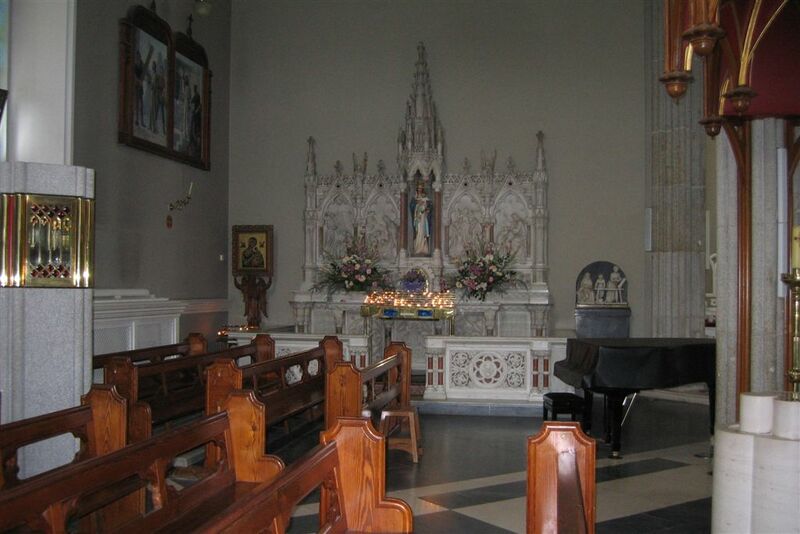 In whose memory this Holy Family is presented to the Cathedral by his loving wife"
A chapel from the penal period existed between Carlow College and the Dublin Road. 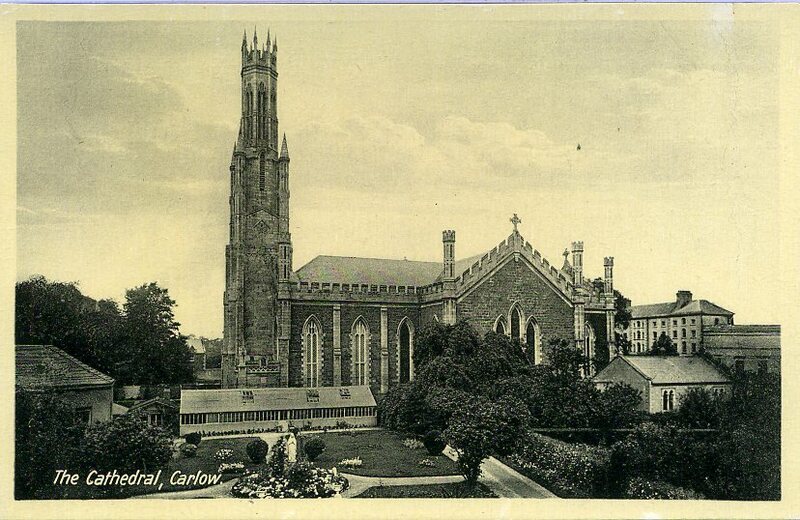 In 1787 Dr. Henry Staunton, Parish Priest of Carlow, built a sizeable Church on the later Cathedral site. 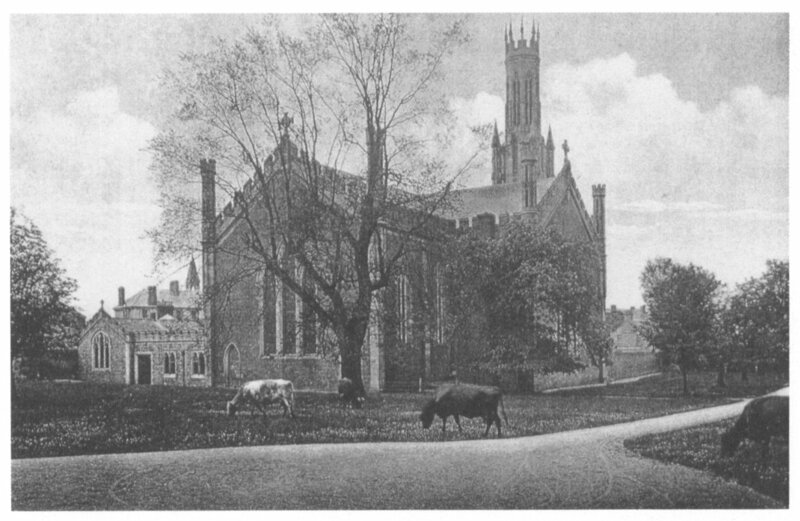 The Cathedral was completed in 1833 and the old church was demolished. Part of its transept walls were retained and incorporated into the new structure. It is gothic in design. Thomas Cobden was the main architect. 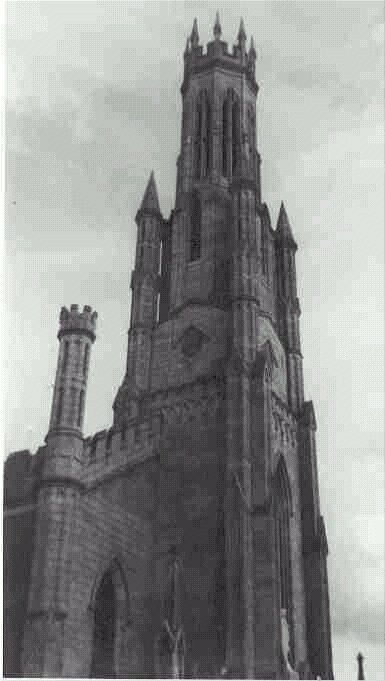 The magnificent tower and lantern, reaching 46 metres, was inspired by the cloth Hall at Burges in Belgium. The story of the Cathedral goes as follows. In the early 1780's Dean Henry Staunton erected a parish chapel on the site of the present Cathedral . 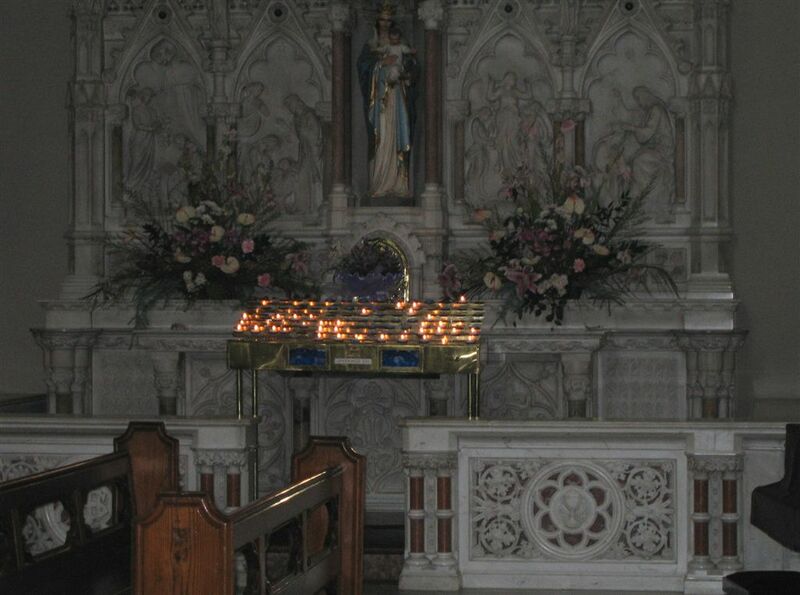 This chapel was dedicated to the Blessed Virgin Mary under the title of the Assumption and stood on a plot of ground leased from Mr. Edward Halfpenny . 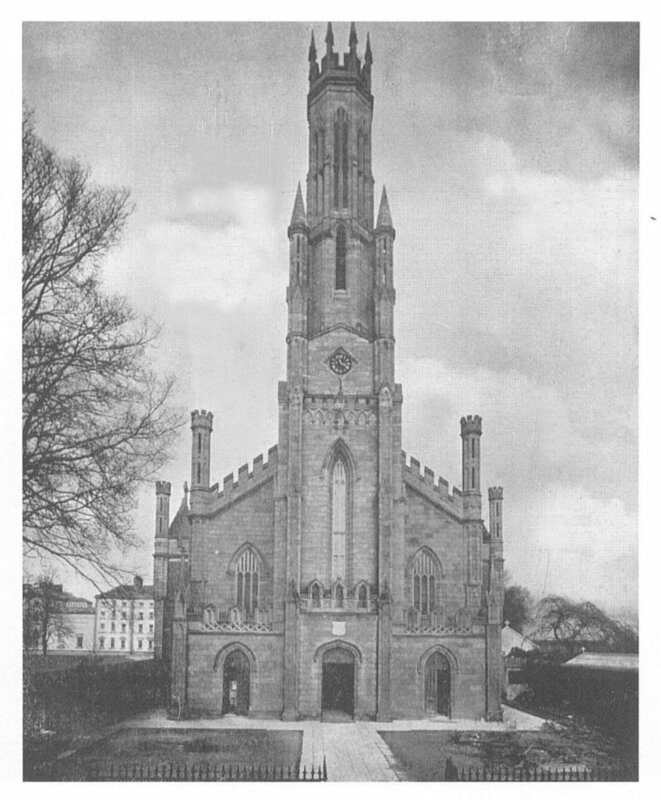 By the late 1820's it would appear that the chapel in Carlow was not big enough to cope with the numbers using it. On Easter Monday, 7th April 1828 the first stone was laid in the area in front of the existing chapel. Many fund raising functions were held. One such function was a dinner held in Coffey's hotel, tickets for the dinner cost £1 each. The building project ran in to difficulties with flooding. Thomas Cobden was then asked to draw up specifications which would overcome these problems. Cobden's plans were dated June 1829, the estimated the cost of labour 3,917pounds 0 shillings and 9 pence. On completion the Cathedral was very simply furnished. John White a carpenter constructed a lot of the woodwork in it, though Cobden himself didn't think it was possible to construct the alter railings. 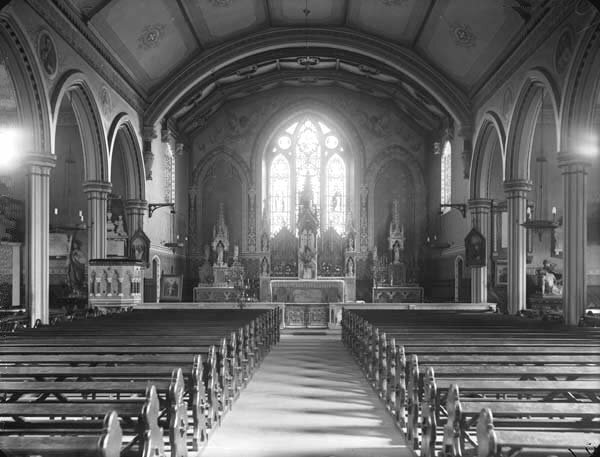 The only surviving original items of furniture are the bishop's chair and the original stalls. 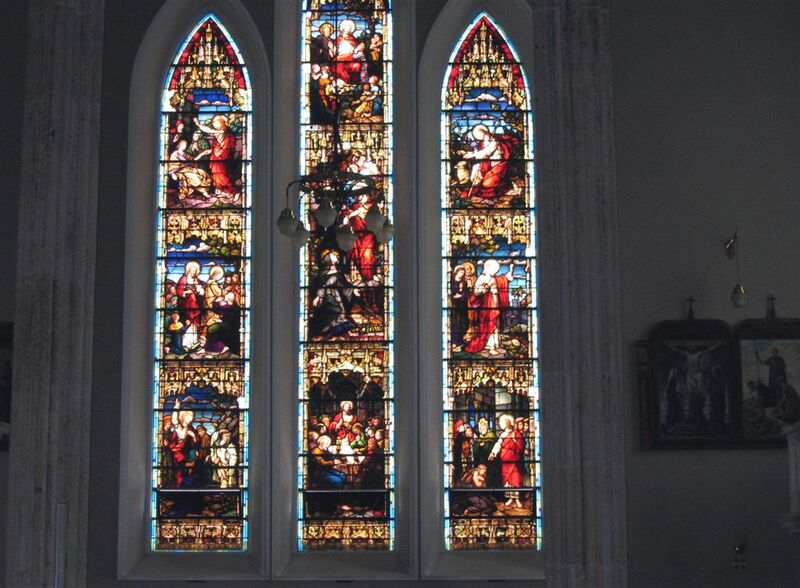 The successful completion of the building work in 1833 represented a magnificent achievement for the people of Carlow and the diocese who contributed the most of the final cost of the building - £9,000. Many changes came over the years to how the Cathedral looked. In 1997 the architect Richard H. Pierce was asked to do up the Cathedral. Pierce himself says that all his changes have been based as closely as possible on shapes and patterns which existed in Cobden's time. 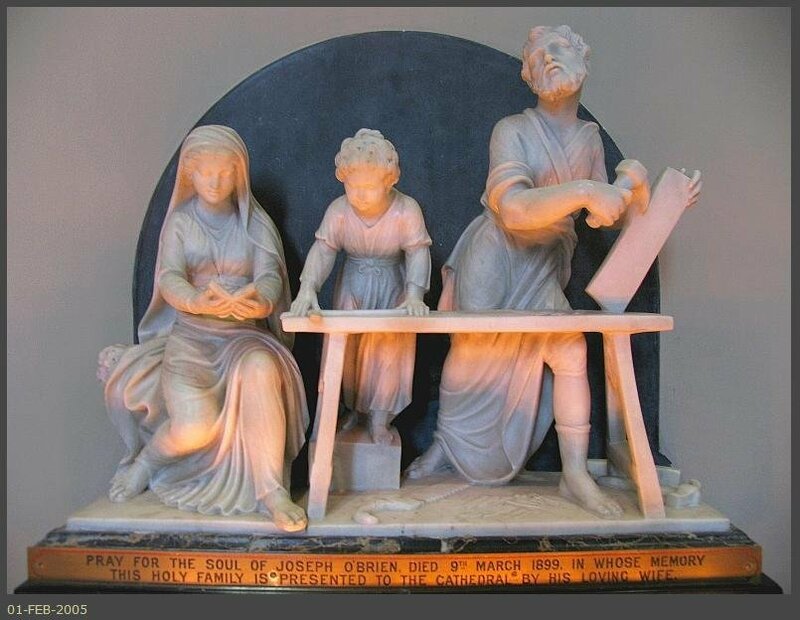 A sculptor in memorial to bishop James Doyle (J.K.L. 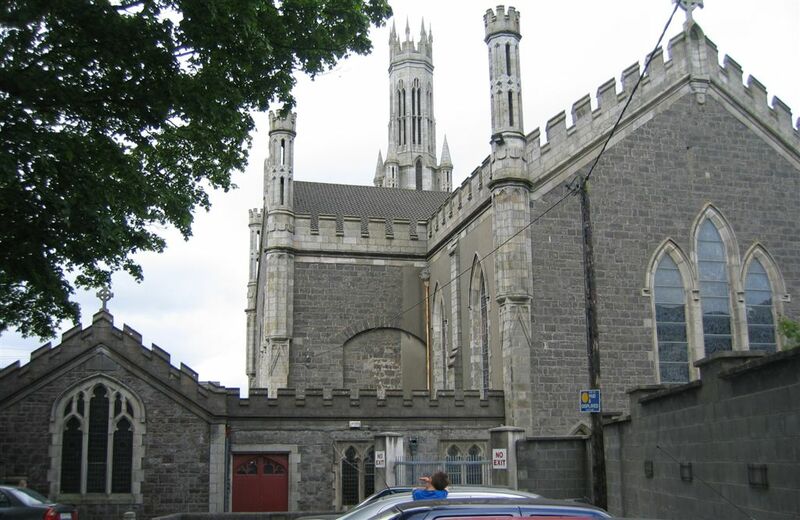 - 1st Bishop of Carlow Cathedral) was finished in 1839 (see picture below). John Hogan was the sculptor. In the statue the Bishop is seen appealing to heaven for the regeneration of his country. Erin is on one knee, her body bent, is beautiful and dignified yet melancholy. The greyish-blue stone used came from a quarry on the Carlow-Tullow Road. 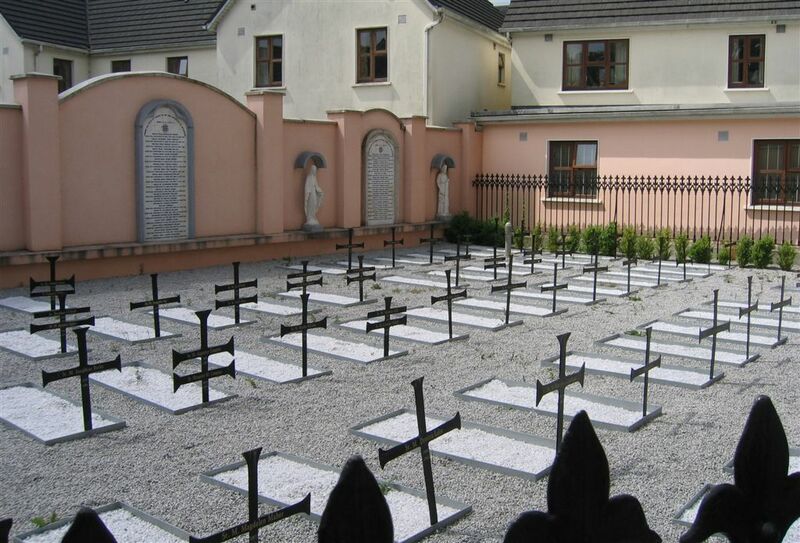 The White granite used came from Col. Bruen's quarry at Graiguenaspidogue. The Oak for the great-framed roof came from nearby Oak Park. The Cathedral is a handsome mixture of Gothic revival styles and was a tower of 151ft. The windows are early medieval in style while the low pitched roof has a late medieval appearance. The picture on the left is of The Most Rev. 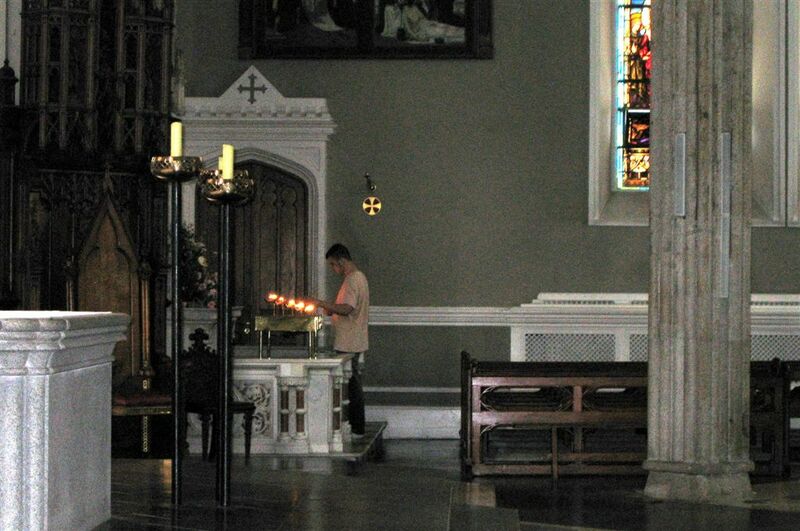 Dr. Doyle ("J.K.L") in his original position in the cathedral before the restoration and the picture on the right shows him in his new location within the cathedral. In 1837, John Hogan of Tallow, Co. Waterford, won the commission for the memorial statue to Dr. James Doyle. It was finished in Rome in 1839 and placed in the Cathedral. "J.K.L" James Doyle (b1786 - d1834), Bishop of Kildare and Leighlin, 1819-1834., that champion of the Catholic cause. 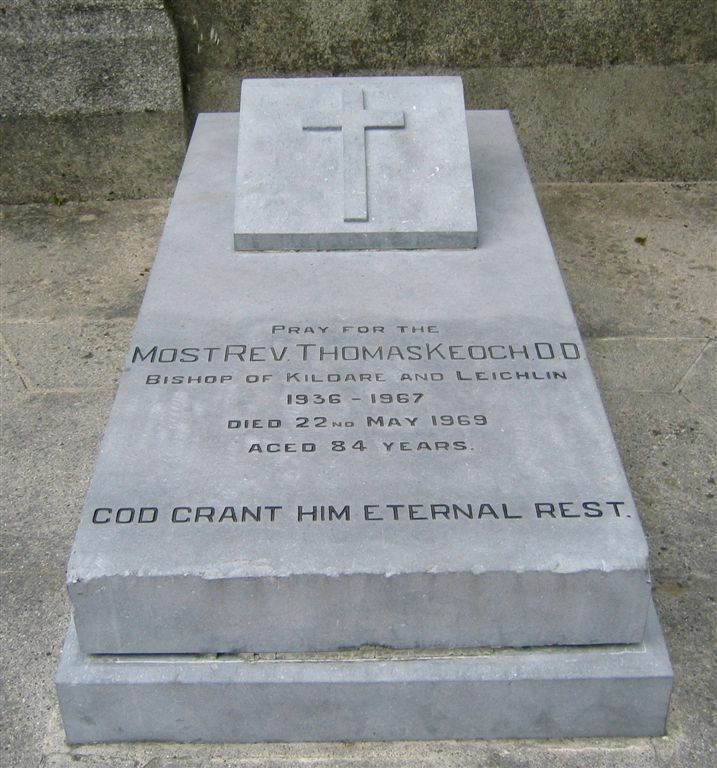 He preached a most powerful sermon at the inauguration of the Pro-Cathedral in Marlborough Street, Dublin on the 14th of November 1925. 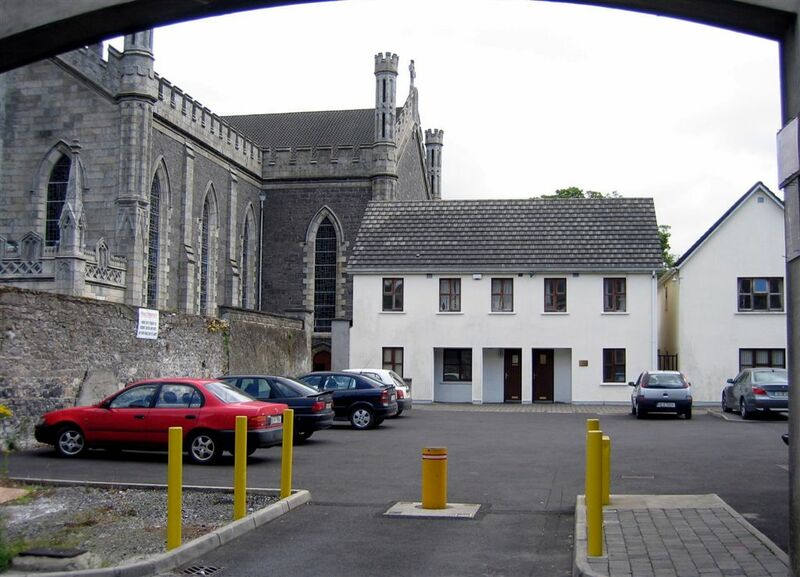 This is a rare view of Carlow Cathedral. A cruciform building designed by Thomas Cobden, it was completed in 1833. The front yard is dug up and in the porch to the left we see a framed notice in the hail, this was a list of people who were entitled to use the gallery and transepts in the Cathedral. This picture was taken by Leo O’Brien around l935,and is remarkable for the time because it was photographed with a box camera. The view covers over 150 feet and includes the top of the railings to the top of the lantern tower. 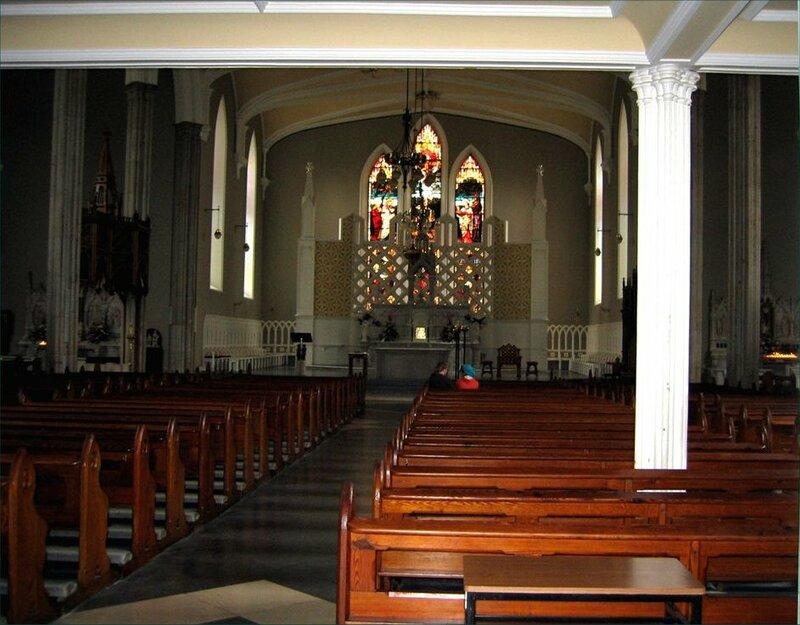 Carlow is the Cathedral town of the Roman Catholic diocese of Kildare and Leighlin. 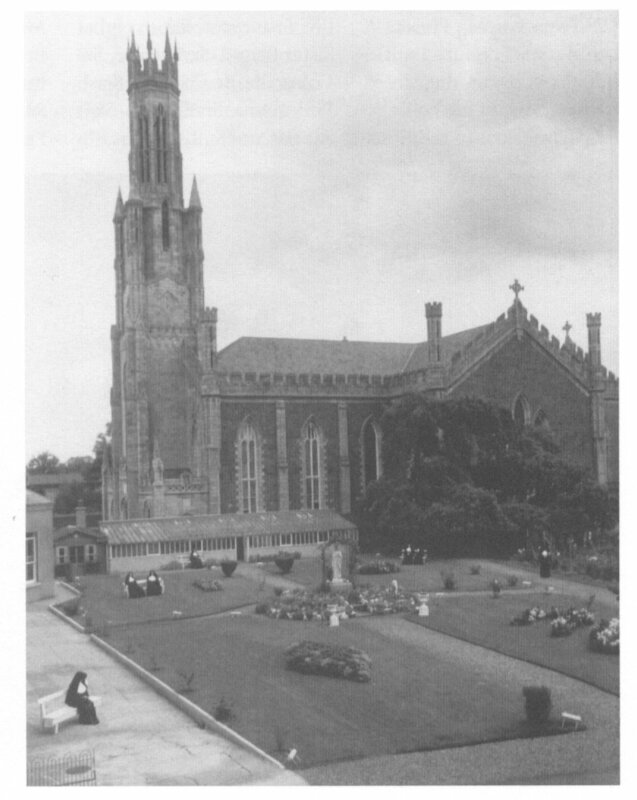 In this rare 1915 picture of Carlow Cathedral we see cattle grazing on the front lawn of St. Patrick’s College! 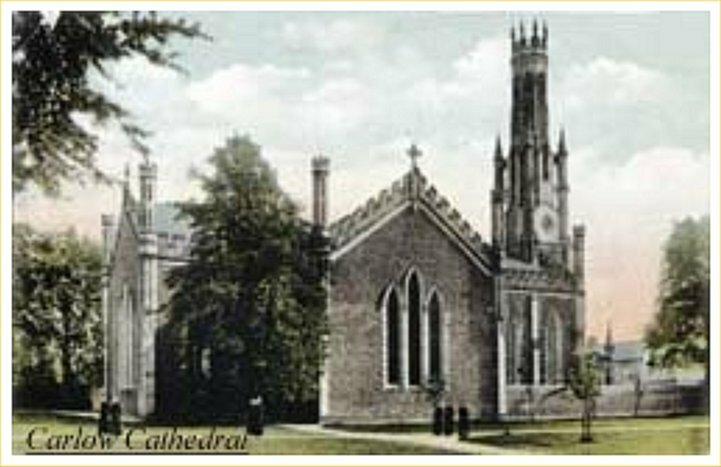 The Cathedral which was completed in 1833 was built around the old parish church. part of the transept walls were incorporated into the new building. The architect was Thomas Cohden. who was also responsible for the design of many eminent buildings in Carlow. To the left in the background we can see the roof and pointed tower of the Presentation Convent. ‘It was Bishop Doyle who more than any other represented his church and influenced the mind of England in favour of concession at the time of Emancipation.’ J.K.L. had laid the foundation stone of the Cathedral in 1828 and following his death in 1834 it was decided that a monument should he erected to his memory. Carved in Carrara marble by John Hogan. Ireland’s leading sculptor of the time, it was Hogan’s idea that his statue of J.K.L. should have the right hand raised and the left hand resting on a symbolic figure representing Ireland. 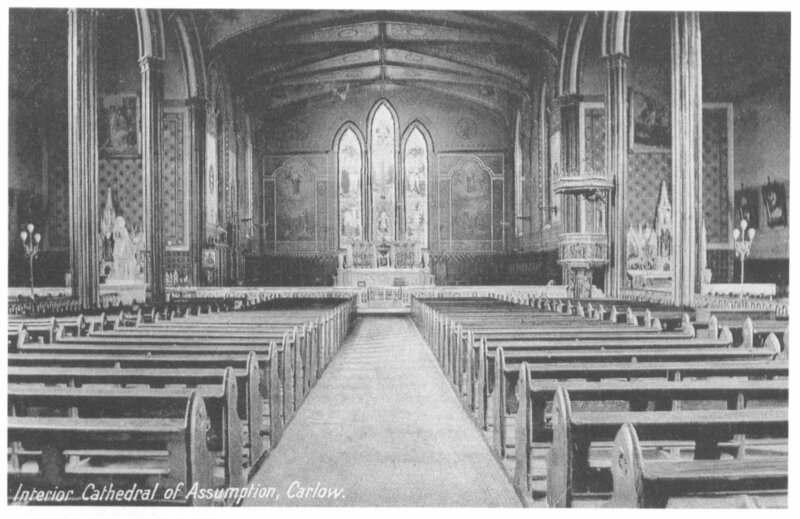 The cruciform designed interior of the cathedral as it looked following extensive refurbishment carried out in 1899. 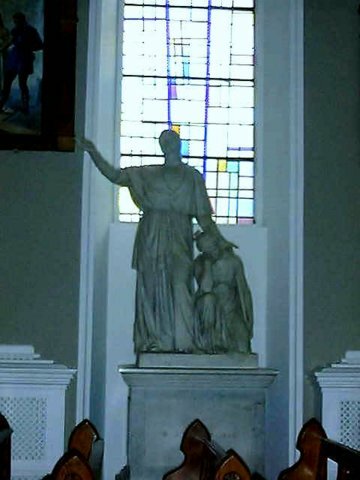 On the left is Hogans acclaimed statue of Bishop James Doyle (J.K.L. 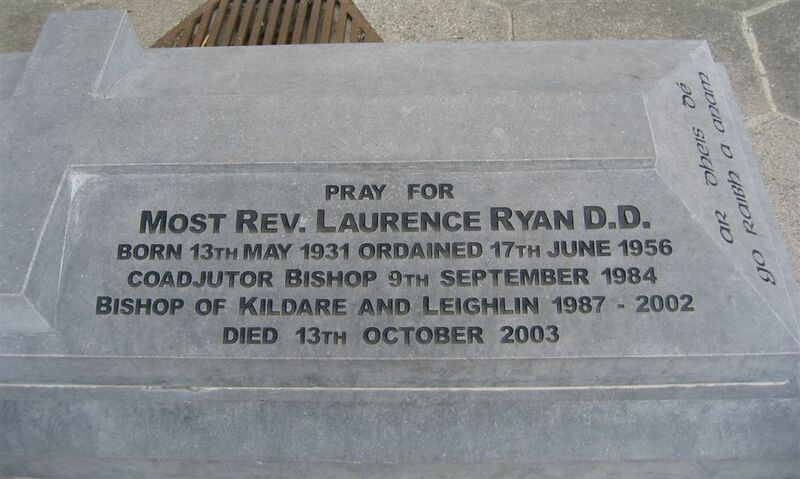 ); he was Bishop of Kildare and Leighlin from 1819 to 1834. 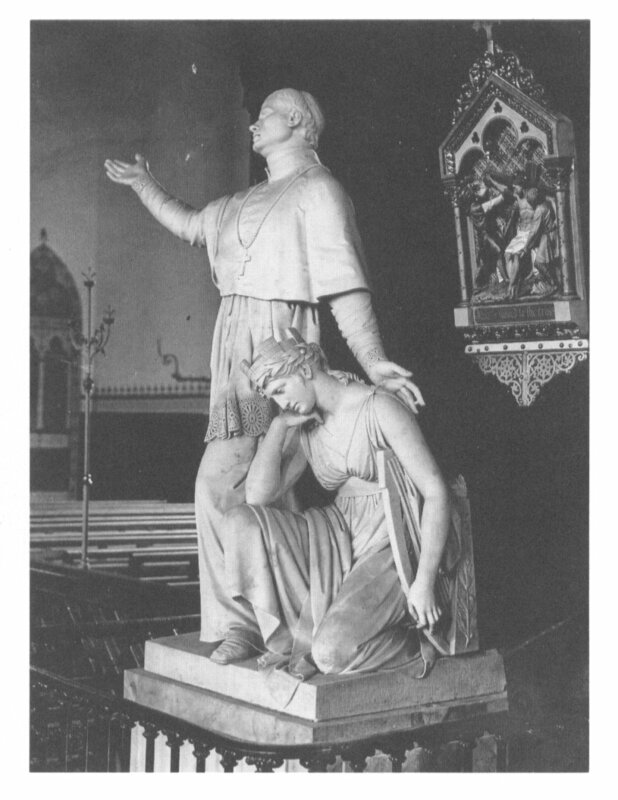 The statue was erected in 1841), its original position was on the right in the Cathedral until it was moved in 1899. The marble Communion rails were the gift of Michael Governey, who was a great benefactor to the church and the poor. The main altar in the centre is of Sicilian marble. To the right we see the exquisitely-carved oak pulpit, which was designed by C.J. Buckley of Youghal and made in Bruges in 1898.